Soaring smartphone and tablet use has doubled the amount of time Americans spend online in the matter of a few short years, finds a new report [download page] from comScore and Jumptap. As a result, as of April of this year, smartphones (39% share) and tablets (12% share) account for approximately half of adults’ time online, a figure which rises to 59% among 18-24-year-olds and 61% among women aged 25-49. Smartphones alone account for 50% of online time for the two above-mentioned groups. Interestingly, while smartphones only account for a relatively small 25% of online time for Americans aged 50 and older, tablets grab 16% share, the highest among the age groups. The share of internet time represented by mobile devices differs greatly from one category to the next. For example, together they account for just 24% of time online with the automotive category and 32% of time spent with TV sites (an outsized 20% of which is on tablets). By contrast, two-thirds of social media time goes to smartphones and tablets, as does 82% of online gaming time and 92% of online radio time. The US’ “digital universe,” referring to the number of adults going online, is 194 million strong per month, per the report. Of those, about 63% (122 million) use both a PC and a mobile device, while PC-only! users nu! mber 58 million (30% share) and mobile-only 14 million (7% share). Those figures are heavily influenced by older internet users. While 17-22% of internet users aged 18-49 are PC-only, that figure jumps to 48% of those aged 50 and older. While only 17% of online women aged 25-49 are PC-only, a greater proportion of online males of that age are so-called “screen jumpers” (mobile and PC users), at 74% share. That’s because a significant 14% share of women aged 25-49 are mobile-only. Here’s a pretty neat chart from comScore, via JumpTap. 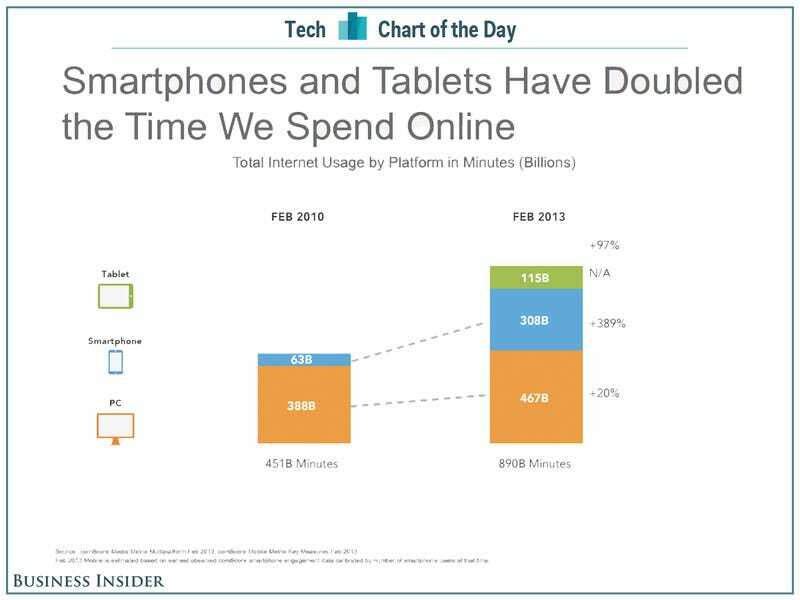 Thanks to smartphones and tablets, people are using the Internet twice as much as they were just three years ago. The bulk of the usage increase has come from smartphones. Mobile commerce spending accounted for almost 10% share of total e-commerce sales during the first half of this year, according to new data released by comScore. Mobile commerce sales have been rising steadily (albeit with displaying strong seasonal variance), reaching $10.6 billion for the first half of the year, a 28% increase from the corresponding period last year. Smartphone commerce, at 6% of total e-commerce spending during H1, is outpacing tablet commerce (3.5% share), but average spending per device owner is actually 20% higher on tablets. That aligns with recent research finding that tablet owners are willing to spend more than smartphone owners. Despite their lower spend per user, smartphones represent a greater share of e-commerce spending than tablets because the number of smartphone users is more than double the number of tablet users. Yahoo surpassed Google as the largest Web platform by monthly unique visitors in July. The data, which was provided by comScore, does not include mobile activity and is limited to U.S. audiences. Yahoo sites managed to attract approximately 197 million unique visitors on desktop during July. Our dataset, which spans more than two years, shows that this marked an all-time audience high for Yahoo sites. 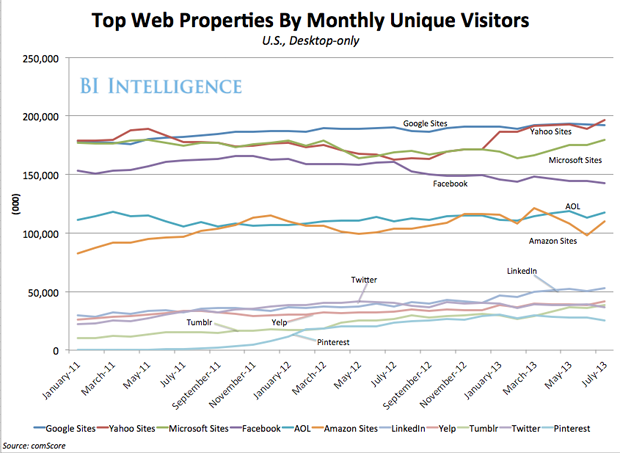 Google, which held the top spot since June 2011, saw 192 million unique visitors on its sites last month. 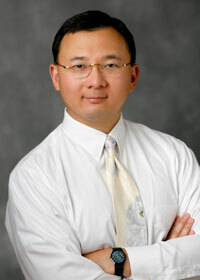 The surge in Yahoo’s desktop audience began in January 2013, when monthly unique visitors increased 9% from the previous month. From December 2012 to July 2013, Yahoo’s desktop audience grew 15%. Some of this audience growth must be attributed to the company’s more sure-footed direction under CEO Marissa Mayer, who took charge in mid–2012. Over the last 12 months, Yahoo has been busy relaunching its flagship properties, including the homepage (in February), e-mail (in December 2012), and weather services. Among social networks, LinkedIn has been a strong performer on desktop PCs. Its monthly desktop audience is 5% larger than it was last month, and 30% larger than it was in December 2012. Meanwhile, Facebook’s desktop audience continues to decline, but makes up for it on mobile, as we’ve noted in recent coverage. Who Doesn’t Use a Smartphone? Smartphone penetration stood at roughly 60% of the US mobile market in Q2, according to recent reports from comScore and Nielsen. That still leaves a sizable 40% chunk of the mobile market that hasn’t yet made the switch. So who is still using a feature phone? The demographics of the feature phone user are broken down in a new study [download page] released by Jumptap. As one might expect, the typical feature phone user tends to be older and come from a lower-income household.